It’s a 5-minute walk from Kanjurmarg station next to Lodha Aurum Grande’. When it was first reported that Runwal had purchased the Crompton Greeves land parcel in Kanjurmarg we were in awe. Crompton Greaves, which had put up its land at LBS Marg in the eastern suburbs of Mumbai for sale, has reportedly sealed the deal with Mumbai-based builder Runwal Group for Rs 1,015 crore. Runwal Group pipped several other top real estate developers like Lodha, Oberoi Realty, Mahindra Lifespaces and Kalpataru Group that were vying for the 34-acre land parcel as per market sources. Runwal has a lot of stake in this area. They are working on Runwal Greens, Forest, Bliss and have acquired Johnson & Johnson land parcel as per market sources. They just can't afford to go wrong. 14. Modern Club House – 12,000 Sq. Ft.
34 acres is a huge land parcel. The 8-acre plot in contention here as a part of the phase 1 development. There are 6 towers coming up from 25 to 34 stories each. 2 Level basement parking + 3 Level Podium Parking zone. Coming to the floor plans the 1.5 BHK is a pure investment proposition. You are buying space not an apartment. The living rooms are just about 150 sqft. which is a letdown. Bedrooms of size (approx. 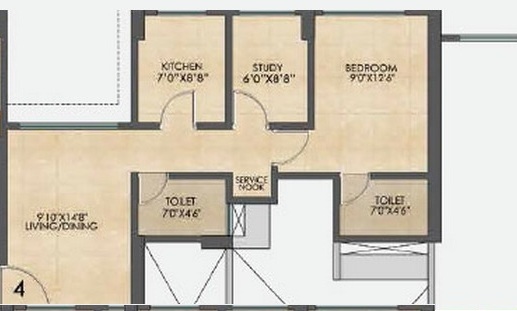 110 sqft.) for sure won't suffice your needs. The good thing about the design is that there is enough privacy in the house. This would be a house best suited for bachelors or someone looking for a 1 BHK. 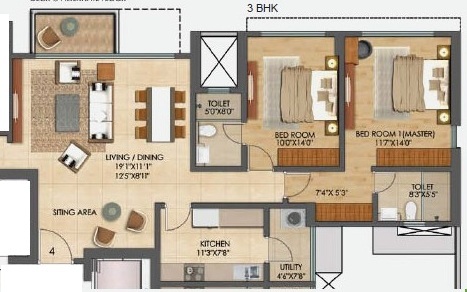 The 2 BHK layouts though not grand are much better. A 220 sqft living dining space will ensure you can keep a 2 unit sofa, a 4 seater dining table comfortably. A separate dining space would have been preferred and the layout would have been cleaner if the width of the living space was more. 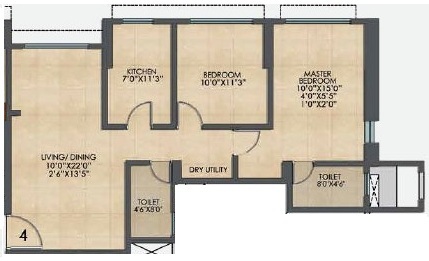 The master bedroom is well sized, almost 150 sqft which is a positive. What is missing is the spacious duct space in the apartment. An apartment best suited for young managers with young families who are looking for an upgrade. These garden facing units are best laid out. You enter and there is an interesting seating zone created. The problem is the seating zone eats into your dining space. The apartment opens into the living room (a foyer is missing) which is large and in size and horizontal in shape which gives it the large expanse. The guest bedroom space and the living space are at opposite ends ensuring privacy. The master bedroom and the kids room are almost 150 sqft which is again a big positive. Overall the flat is good. The 3 BHK AC apartments come with video door phones at entrance, 11 feet floor-to-floor height, Italian Marble in a living room, wooden flooring in all master bedrooms, wide French windows & Home Automation system The apartments are loaded with amenities. They would be preferred by a family of 4. Located next to Lodha Aurum Grande, Runwal Bliss is close to the railway station, the Eastern Express highway and the JVLR. Connectivity is sorted. Apartments would offer you open views of the Vashi creek. Entertainment options include R City mall which is 6 km’s away and Hiranandani Powai which is approx. 4 km’s away. The location is very homely and peaceful. You are well connected yet away from the maddening crowd. What is desired is a school and hospital. Currently, you are dependent on Vikhroli (Godrej school & Godrej hospital for your needs). There is an upcoming 7-star hotel which is again a welcome addition. Overall the location is a winner! Quality is our only concern we hope Runwal delivers a good quality product. We would have preferred waiting for possession and making the purchase but the product offers promise, everything looks good on paper. Having said that do check for clearances & documentation before taking a final call.